These responsibilities are subject to a limit on the number of hours set by the Department of Social Services. • Understand and make decisions regarding your medical care. If you do not meet this requirement, you may choose someone to act on your behalf. • Have doctor’s orders for home care. • Be eligible for Medicaid, Medicaid Managed Care plans, or a health insurance plan that contracts for CDPAS services. If accepted into the Taking Control program, you can hire almost anyone to be your personal assistant, including family members. The person hired does not have to a professional license of any kind – but you must have the ability to train, monitor, and direct the tasks that your assistant performs for you. 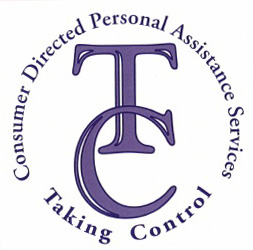 In order to qualify for the Taking Control program, a person must have doctor’s orders for home health care, and be self-directing or have someone willing to do this for you. Once these are in place, contact MILC for further instructions on how to enroll with your insurance company, or through the county Department of Social Services. All individuals wishing to enroll must have a home visit to assess your needs. When this visit happens – it is important to have a list of tasks that you would like performed for you. MILC can provide you with a sample list of tasks. Once approved for hours of home care, MILC will be contacted to begin the final steps to enroll you in the program. How Do I Hire Attendants? If you don’t already have someone in mind, we will help you find one. We can show you how to place advertisements, talk to current assistants, etc. Once you have selected someone you want to provide your care – have them contact MILC. MILC will begin the enrollment process. Your assistant will need to have a physical and a tuberculosis test. We will pay for the costs of both if it is not covered by the assistant’s insurance. If they pass both exams, and all enrollment paperwork is complete, MILC works with the assistant to arrange for them to use the automated check in system. Once all steps are completed, the assistant can begin working with you. As a person with a disability, Control is a key factor for getting what you want out of life. Having the ability to respond to opportunities while exercising the flexibility to change according to any given situation – is imperative to succeeding in your goals. Working with “traditional” Personal Care Aides, this flexibility is diminished by the need to work with schedulers and nurses, creating a schedule that is very difficult to change and may actually limit independence and freedom of choice. That’s where Taking Control comes in. This program will allow you to become the supervisor of your own personal assistance services. You can hire who you like, train them in areas important to you, and supervise their work on a daily basis. Tasks are not as limited as they are in a traditional care aide plan. If a personal assistant does not work well for you, you can replace them. MILC would like to make your experiences with the Taking Control Program the best they can be. This is your opportunity to tell us what is going right, what is going wrong, and how to make things better. Please go to the links below to complete the appropriate online Feedback Survey. If you wish for MILC to follow up with you personally on any concerns/issues you raised, please provide your name and contact information at the end of the survey, otherwise your responses will be strictly confidential.